Thanks to everyone who entered! Wishing you all a merry Christmas! It’s the last day of the 12 Days of Christmas Giveaway! That’s right, we’ve been building up, adding prizes every day. And we’re going to give ALL of them away to one winner tonight! We have books. We have goodies. We have ornaments and tote bags. And today . 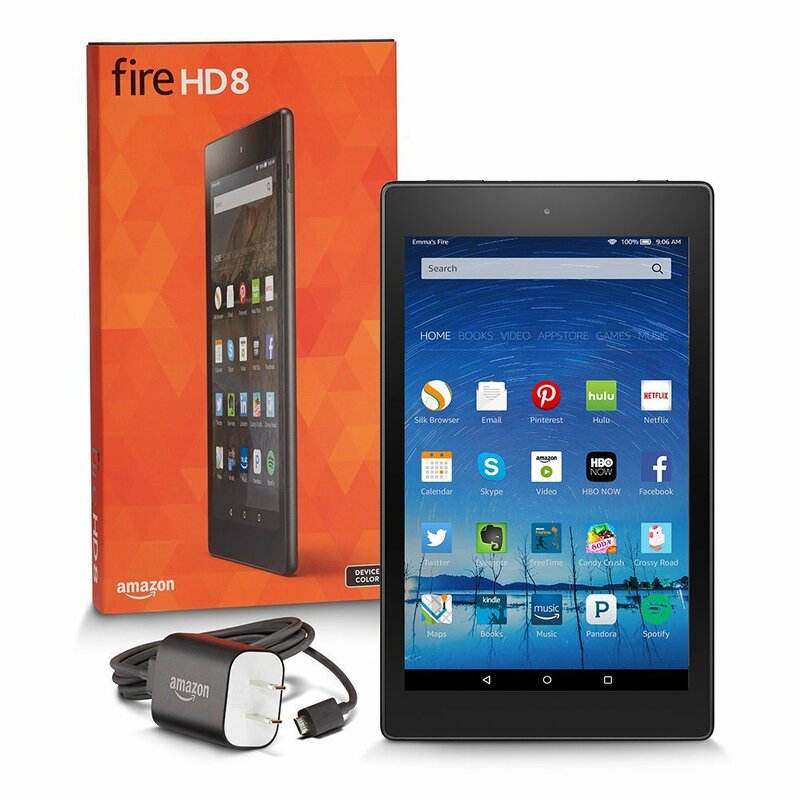 . . today we’re adding a Kindle Fire HD 8! It’s not too late to enter in the Rafflecopter giveaway below by following some of your favorite authors on social media and signing up for their newsletters. We’ll draw the winner tonight after midnight CT, and you could win! Make sure you have all of your entries in before the giveaway closes, and good luck! It’s Day 4 of the 12 Days of Christmas Giveaway! Fifteen years after she left Prince Edward Island, Natalie O’Ryan had no plans to return. But when her fiancé, music producer Russell Jacobs, books their wedding in her hometown and schedules a summer at Rose’s Red Door Inn, she sets out to put the finishing touches on the perfect wedding. But she can’t possibly prepare for a run-in with Justin Kane–the best friend she left behind all those years ago after promising to stay. Justin’s never forgotten Natalie or the music career he always dreamed of pursuing. 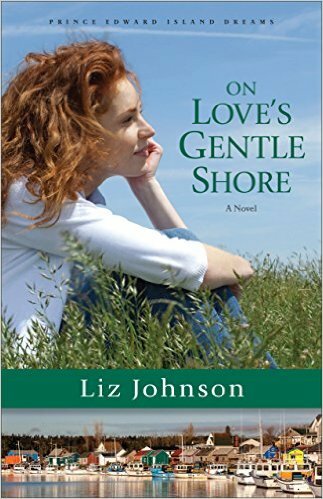 He’d been prepared to follow her off the island until his dad died and he was left to run the family dairy farm. He’s done the best he can with the life that was thrust upon him–but with Natalie back in the picture, he begins to realize just how much joy he’s been missing. After Natalie’s reception venue falls through, she must scramble to find an alternative, and the only option seems to be a barn on Justin’s property. As they work together to get the dilapidated building ready for the party, Natalie and Justin discover the groundwork for forgiveness–and that there may be more than an old friendship between them. Make sure you’ve completed all of the entries in the Rafflecopter giveaway below for a chance to win today and every other day of the giveaway–including the grand prize, which includes a Kindle Fire HD 8. And be sure to stop by Erica Vetsch’s website tomorrow to see what she’s adding to the giveaway! On the first day of Christmas, my favorite authors gave to me . . . 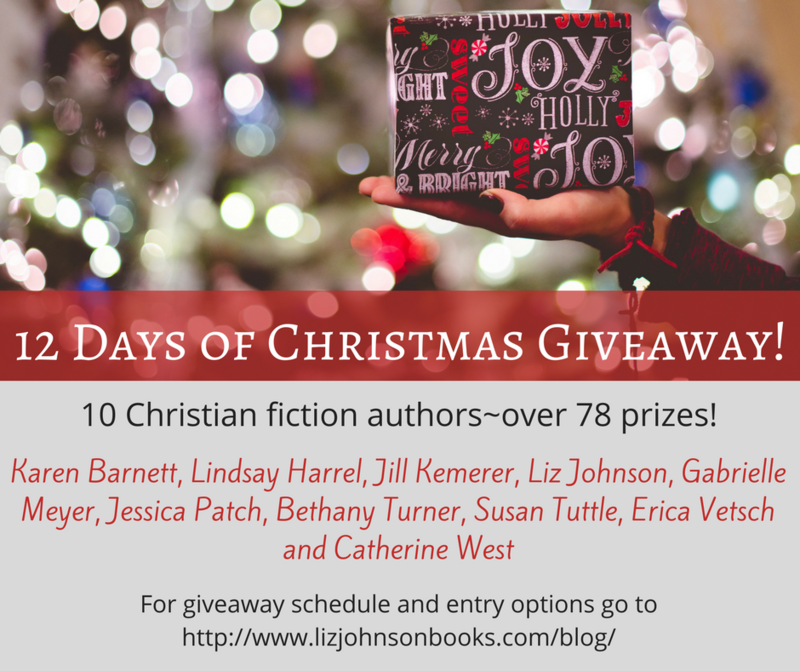 Ten Christian fiction authors are hosting the 12 Days of Christmas Giveaway! 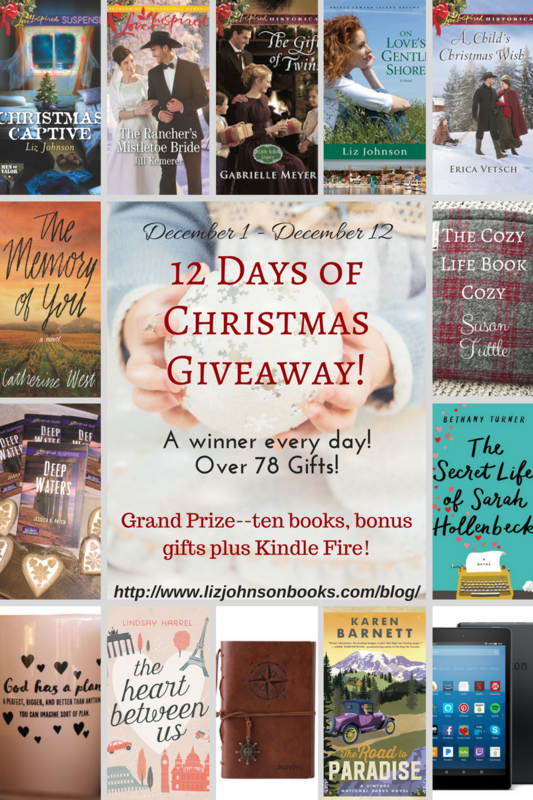 Every day from December 1st through the 12th, we’re giving away books, Christmas goodies, and so much more! Here’s how it works: Register at the rafflecopter below. 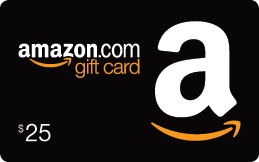 We’ll randomly select a winner each day for the first twelve days of December. And every day the prize builds–another book or book-related goody added, all the way up to an Amazon Kindle Fire HD 8 on the last day. On his cousin’s Christmas cruise wedding, navy SEAL Jordan Somerton anticipated having the typical best man duties—not facing down criminals boarding the ship. But when the luxury liner is infiltrated by men determined to kidnap the flower girl, he’s plunged into an unexpected mission. Maid of honor and DEA agent Amy Delgado hasn’t forgiven Jordan for a misunderstanding in their pasts. But with her young niece targeted, she must draw on Jordan’s skills as a protector. Signs point to an inside job. 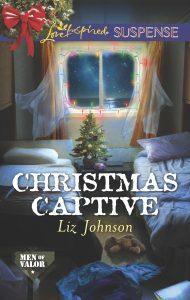 With a traitor in their midst, can they ensure that every passenger returns home safely for the holidays…even as they find love amid deepening danger? 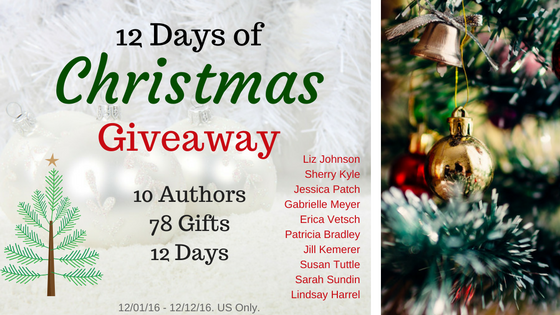 Enter in the Rafflecopter giveaway below by following some of your favorite authors on social media and signing up for their newsletters. We draw a new winner every day, and on December 12th, we’ll give away a Kindle Fire HD 8. And be sure to stop by Jill Kemerer’s blog tomorrow to see what book is being added to the giveaway. Thanks so much to everyone who joined in the 12 Days of Christmas Giveaway! Congratulations to the 12 Days of Christmas Giveaway winners for Days 9, 10, 11, and 12! Thanks again for joining us and merry Christmas! On the twelfth day of Christmas, my favorite authors gave to me . . . This is it! We’ve made it to the final day of the 12 Days of Christmas Giveaway! The gifts are amazing (my thanks to all of the authors who joined in to make this such a fun giveway!) and one lucky winner will receive all 12 gifts! The prizes have been building, and today’s winner will receive all of the below! It’s not too late to enter in the Rafflecopter giveaway below by following some of your favorite authors on social media and signing up for their newsletters. And don’t forget that these books make GREAT gifts. Need a stocking stuffer or treat for your favorite reader? Look no further! Links are included above. Thanks for joining us for the 12 Days of Christmas Giveaway! Congratulations to the 12 Days of Christmas Giveaway winners for Days 5, 6, 7, and 8. It’s not too late to enter (add your entries in the rafflecopter form by following some of your favorite authors)! We have more days of winners and the gifts are growing every day. Enter your email address to receive Liz’s updates, news, and more!